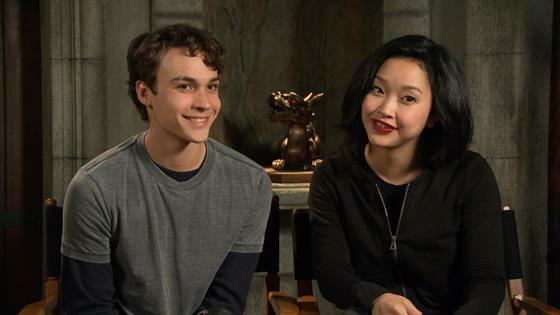 You fell for—and felt for—Lana Condor in To All the Boys I've Loved Before, but Lara Jean she ain't in Deadly Class. The new Syfy series, based on the comic book of the same name, sees Condor trade in the love letters for a katana as Saya Kuroki. "There's not much—they're very different," Condor told E! News about her two famous characters while on set of Deadly Class. "I think that's something that I really wanted to do, to be able to crossover all genres and to be able to pick different roles so that people can see me in a different light. But, yeah, Lara Jean, I gotta say, I don't think she'd survive in Kings Dominion, but neither would Saya in a dress like Lara Jean is always in. They're polar opposites, there truly is no similarities whatsoever...They're girls, and they're OK with being on their own, that's it." Set in the 1980s, Deadly Class follows Marcus (Benjamin Wadsworth) a teen living on the streets who enters Kings Dominion, a private academy where the top crime families from around the world send their kids. If you thought your high school experience was rough, think again. In the video above, Wadsworth and Condor reflect on their high school experiences as compared to the one their character experiences on the series. Plus, Wadsworth admits to being a fan of Condor thanks to X-Men and the duo reveal how they got prepared to enter the world of the 1980s-set series. The series is based on 2014 comic by Rick Remender and Wes Craig. Benedict Wong, María Gabriela de Faría, Luke Tennie, Liam James and Michel Duval also star. Deadly Class airs Wednesdays, 10 p.m. on Syfy.